This week, Enlace Chicago, has launched a project that will address the dire needs of the most densely populated community in Chicago, Little Village, by creating a new, innovative facility called, Casa Destino. More than 80,000 residents live in the community and many will utilize the new three-story 7,800-square-foot building when the doors open in October 2016. Casa Destino will consist of a multi-purpose room, offices for one-on-one counseling, mentorship, and legal services. 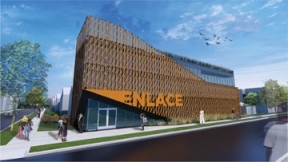 The new facility will also include a computer lab, a community garden, along with an efficient workspace for Enlace’s growing staff of 34 full-time and 180 part-time employees. “I am beyond excited today to announce the launch of our efforts to create Casa Destino in the heart of Little Village”, said Michael D. Rodríguez, executive director of Enlace Chicago. “We strive day-to-day to improve the quality of life of Little Village residents, they deserve the best. Casa Destino will help us achieve this goal by fostering a safe and healthy environment for youth and families, and will create opportunities for educational advancement and economic development.” Casa Destino will meet the criteria necessary for Enlace to become the first U.S. Department of Housing and Urban Development (HUD) certified agency in Little Village, while amplifying Enlace’s case management services. With HUD certification, Enlace would be able to provide housing services to over 300 families each year.